﻿﻿﻿﻿In honour of United Nations Day on the Elimination of Violence Against Women, Nicole Devarenne will talk about the strength and resilience of women as it has been represented by African writers and filmmakers. The talk will begin with Sol Plaatje’s Mhudi (1930), one of the first novels by a black South African, and go on to consider how writers such as Bessie Head, Tsitsi Dangarembga, and Chimamanda Ngozi Adichie have placed women’s experience in the foreground of their stories of survival, renewal and resistance. The talk will also touch on films such as Ousmane Sembene’s Moolaadé and Darrell Roodt’s Yesterday. Dr. Nicole Devarenne teaches modules on ‘The African Novel’ and ‘South African Literature and Film’ in the School of Humanities at the University of Dundee. She has published articles in Research in African Literatures, Journal of Commonwealth Literature, Journal of Southern African Studies, and The London Review of Books. She is a member of the Scottish Centre for Global History at the University of Dundee. Before our Guest Speaker takes us through the literary aesthetics on women representation in the literature and film, members of the audience will have an opportunity to read their literary pieces concerning the central theme. Such pieces need not be their own original works. However, people who read will be expected writers’ names and the sources. We invite you to bring any piece of writing such as poems, short stories, books and literary materials to the venue to read to our enthusiastic audience. Writings on women generally and sub-themes such as feminism, love, motherhood, strength, resilience, sacrifice, relationship, culture, girl child education, dignity, heroines, empowerment, leadership among others are all welcome. We invite you to this event as Dundee Africa Rsearch Network (DARN) joins the rest of the world to mark United Nations Day on the Elimination of Violence Against Women. Literature is the mirror of life. Come, let’s see through this fascinating mirror with Dr. Devarenne. The last talk (The Path to Sustainable Development) on 27 October 2016 was a huge success. Members of the convening team are deeply grateful to all attendees. They included students and staff of the University of Dundee, but also students from the University of St Andrews and Abertay University who made various insightful comments. Vincent Onyango, Edwin Ezeokafor and Theophilus Dapel made their individual presentations, as previously advertised. The universality of corruption was a dominant view from the audience. While corruption was roundly condemned, a strong case was made for African countries to develop despite various corrupt practices. Nevertheless, weak institutions and a lack of robust regulatory regimes were highlighted as significant challenges. Such challenges are sometimes compounded by foreign investors who are overly focused on making profits and exploit the weaknesses of their host countries. As such, it was also argued that African countries need to relate with other countries on an equal partnership basis. It remains open to debate, however, how much equality can be achieved where some African economies are run almost entirely on finite natural resources. The global oil price collapse is illustrative of the need to implement comprehensive national economic plans, including the diversification of revenues. In appropriate contexts, “African solutions to African problems” would have its appeal. However, a word of caution from Vincent Onyango: there is no African way of fixing a car. See more photos of the event via this link: https://goo.gl/photos/xYDVFRtfMLz4F21A8 . The discussion on sustainable development in Africa is built on a tripartite structure. Vincent Onyango focuses on the triad of process, substance and “enlightened or ideologised” approaches in relation to a representative case study (Kenya). This involves a juxtaposition of Brundtland’s concept of sustainable development and indicators of performance, with a view to problematising existing challenges. He considers possible solutions by examining a more transformational and fit-for-purpose approach in the light of Brundtland’s view. Edwin Ezeokafor considers the inadequacies of the Millennium Development Goals, especially from the standpoint of security. This entails an examination of intractable terrorist activities, restiveness caused by subnational groups and non-state actors, and how cross-border crimes have undermined sustainable development in Africa. Dapel Theophilus examines sustainable development in Africa, with Nigeria as a case study. This sub-theme involves a detailed analysis of the forces that have shaped the economic situation of Nigeria. He also considers possible solutions. Dr Vincent Onyango is a lecturer in Town and Regional Planning at the University of Dundee. He is also the Degree Programme Director for MA Environmental Sustainability. Part of Dr Onyango’s recent research concerns the relationship between austerity and environmental decisions. Dr Edwin Ezeokafor obtained his PhD from the University of Dundee. His doctoral research explored the interface between the processes of securitising threats in West African states in the context of neo-patrimonial statehood. Dr Ezeokafor is also a founding co-convener of the Dundee Africa Research Network. Dapel Theophilus is a PhD candidate at the University of Dundee. His research is focused on poverty mobility, inequality and oil in Nigeria. On behalf of Dundee Africa Research Network (DARN), we welcome our members and friends within the University and beyond into 2016/2017 academic session. We also appreciate your support so far on our successful past events. We count on your support in the new session towards the success of our scheduled events, especially on the questions that beg for answers concerning the African state of affairs in its multidimensionality. The meeting will focus on various important issues including the following: Report on DARN activities in the last year, DARN's online presence - presentation of DARN's logo for, and DARN's annual events/ projects. We look forward to welcoming you to this fascinating deliberative session. Please, share this with your colleagues. 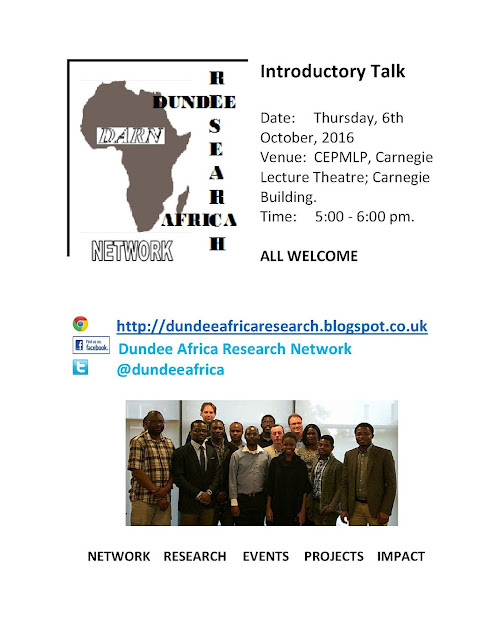 Established in June 2015, DARN is an acronym for Dundee Africa Research Network. 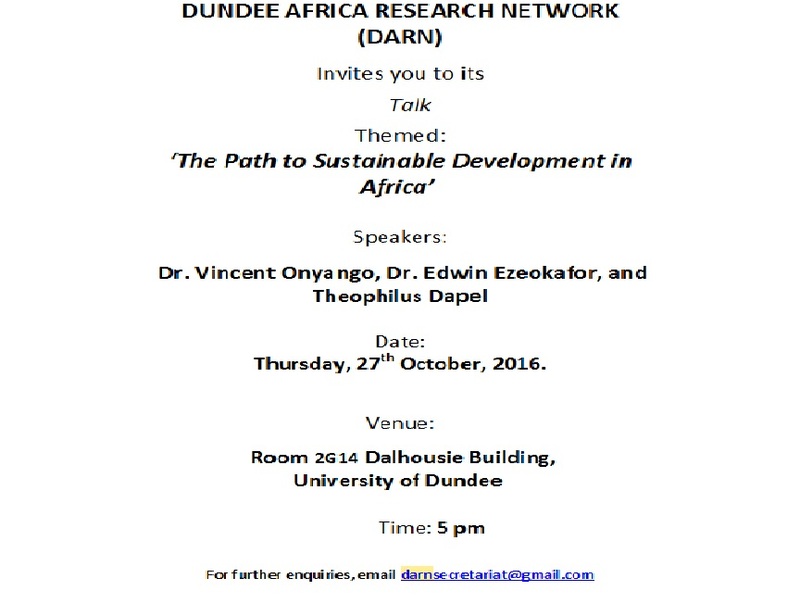 The inspiration for DARN is the consolidation of the African presence in Dundee by creating a forum for multidisciplinary research on Africa. As we know, networking among researchers in related fields or areas of study provides an intellectually stimulating forum for established scholars, early career researchers, students, policy makers, and civil society actors. Also, generally, it includes people who have an interest in such research. 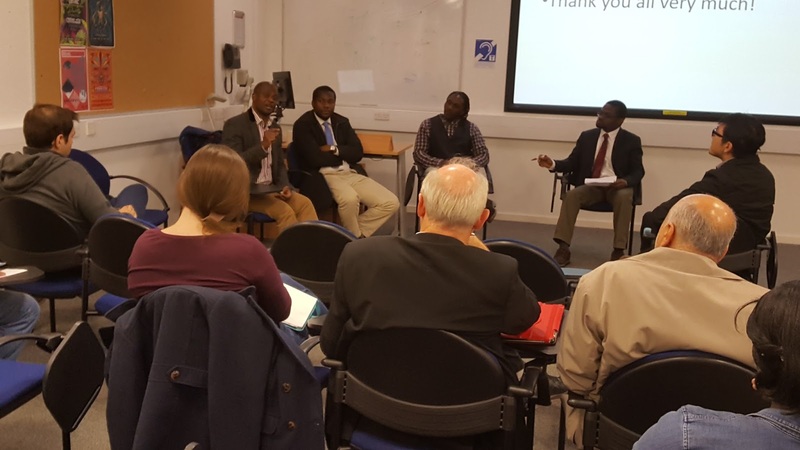 Considering the number of African students and researchers on different areas of African studies within Dundee and environs, DARN brings out the best of African research through regular interactive events concerning topical issues on Africa with their global implications. DARN is taking its place within the University research community and this enhances the drive for internationalisation in African research generally. • To consolidate the presence of Africa in Dundee by providing an avenue for the promotion of multidisciplinary research on Africa. This includes politics, governance, African integration, security, energy economics, extractive industry issues, oil and gas, history and literature, gender and human rights, law, trafficking in persons, migration, transnational organised crime, African traditional medicine, development and Africa’s international relations. • To establish Dundee as a centre for serious engagement on African issues by attracting experts on relevant and critical African questions of development in their multidimensionality. • To serve as a network for engaging African students studying in Dundee and environs to promote regional and specific national events relating to Africa regional organisations as well as understanding the role of African citizens in sub-regional economic development initiatives, African Union Agenda 2063 and the sustainable development goals for Africa. • Provides opportunities to network with researchers and experts in various fields. Speaker: (Dr. Patrick Tom, University of St Andrews).